In time with Black History Month, MGM has re-released this very peculiar 1970 documentary on Mohammed Ali. It was made during the time when Ali was unable to box due to his refusal to go to Vietnam, and so we get see a unique perspective of this great athlete and influential cultural figure at the midway point in his career. Some silly psychedelic experimental techniques briefly marr an insightful and valuable timecapsule of this first half of Ali's life. Richard Kiley narrates the career of the talented boxer from his early childhood, his Olympic glory, his reign as Champion as Cassius Clay, his conversion to Islam, his outspoken political life and to his banishment from sanctioned boxing. Intercut with the neatly assembled archival footage is a fun conversation between Ali and his manager Cus D'Amato discussing the history of the sport, and with humour analyzing his former opponents and poking fun at themselves. The build up to Ali’s famous battle with Sonny Liston now matter how many times we hear is still one of the most thrilling moments in sport. One of the interesting explorations is Ali’s preparation and analysis of his fighting style which included studying the famous Sugar Ray Robinson/Jake La Motta fight. Documentaries have come a long way since 1970. The opening credit sequence is especially awkward. An atrocious funky music cue runs behind poorly edited series of still photos of Ali. The structural and technical sloppiness in comparison to the polish of docs we see today makes a startling contrast. 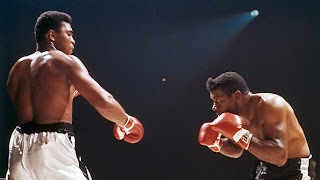 But with the technical aside, the archival footage says it all and Ali’s charisma carries the picture. No matter what Ali's says he’s magnetic. We get to see plenty of his wild press conferences and speeches - often waxing poetically, often rambling in a kind of 'speaking in tongues' sermon style. While we now revere Ali’s career its interesting listening the divise reactions to Ali’a bold confidence. Kiley's narration is written with the verbage of a journalist. It feels dated and tells us explicitly what could be implied by the imagery, but he makes some insightful conclusions about Ali's personality and his responsibility to his religion and to African-Americans. "Aka Cassius Clay" is a treasure for boxing fans. And even more so, knowing that his best days were in front of him and that neither the filmmakers nor Ali know it yet.